BOSTON – The yellow cloth towels twirl in the air after goals or when the TD Garden asks Boston Bruins fans to get loud. Sometimes they’re thrown on the ice in protest or taken home as souvenirs. Sometimes they end up on the concrete floors, soaking up spilled beer after the game. And sometimes they’re meticulously stitched together by crazed Bruins fan into a full business suit that he wears to playoff games. If the ‘rally towels’ contain some mystical powers of encouragement, then Ken Cruise is their living totem. 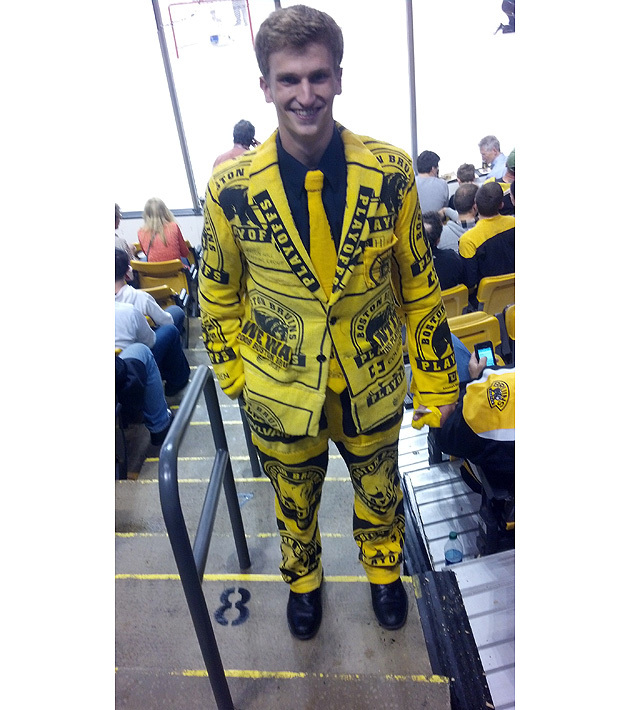 The 21 year old Bruins fan from Rhode Island attended Game 3 of the Stanley Cup Final on Monday night and was an inescapable sight in Section 4: Cheering on the Jumbotron in a bright yellow suit constructed entirely from used rally towels. Cruise created his suit over the last two years by depending on the kindness – well, actually the disregard – of others. He walked through the Garden stands after 2011 playoff games, collecting as many pristine towels as he could, along with a few soiled ones. He cleaned them up and then stitched them together into the masterpiece he now wears to some Bruins home games. How many towels make a Rally Suit? 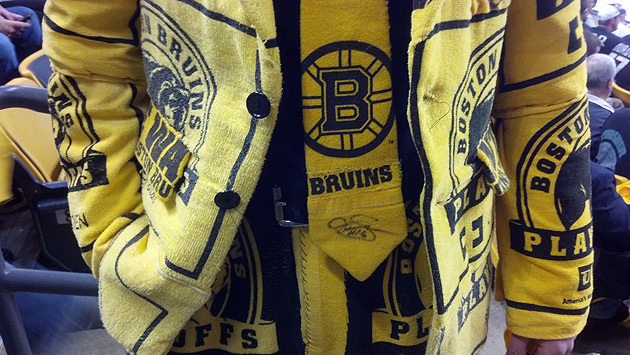 We’re talking meticulous detail here: He created pockets on the jacket and a tie for the suit – getting it signed by Boston Bruins legend Derek Sanderson. Cruise said he wore the suit to every playoff game last season, a few regular-season games in 2013 and then to this postseason run, which has the Bruins up 2-1 in the Stanley Cup Final against the Chicago Blackhawks. Every time he wears it, he needs to repair it, as stitches pop and towels shift. But Cruise said the effort it worth it. Indeed it is: For all the jerseys and bear suits and various Bruins swag seen at home playoff games, nothing beat s a Rally Towel Suit for Boston fanaticism.